I’m calling my entryway finished for now. This is kind of a strange before and after, since my house doesn’t really have a defined entryway. What I have is a front door that leads to a big room that I’ve decided to call an entryway on one side, and a dining room on the other. And while the one wall that I call the entryway is pretty much finished (with the exception of some accessorizing, which I’ll do when I finish the rest of the room), the entire other side of the room still has quite a way to go. This is going to be kind of a mini before and after. I’ll do a much more thorough before and after, including more of the process of getting from the before to the after, when I finish the rest of the room. And unfortunately, I didn’t really get good before pictures of this wall, so the befores really aren’t from the same angle. You can still get the general idea, though. 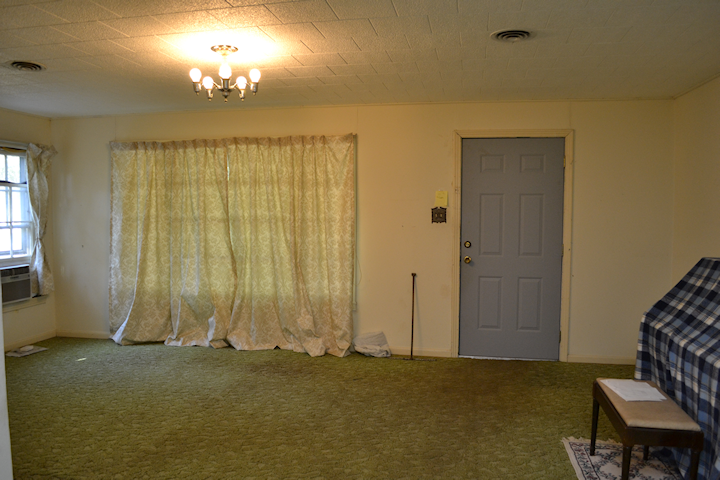 I wish I had a better picture of this before view, but this is what this area looked like standing in what is now the music room, and looking back toward the front door, with the entryway wall on the right, and the dining room on the left. It looks like a different house, right? And you’ll notice that I made some changes. Again. The green walls are gone. I didn’t like how they looked with the chairs. And those walls changed color so drastically throughout the day that sometimes I’d love the color (in the morning light), and other times I’d hate it (in the evenings). So it had to go. I tried a few other wall color samples, but it seemed like any color at all just looked drab and dull, so I went back to white — Behr Polar Bear. 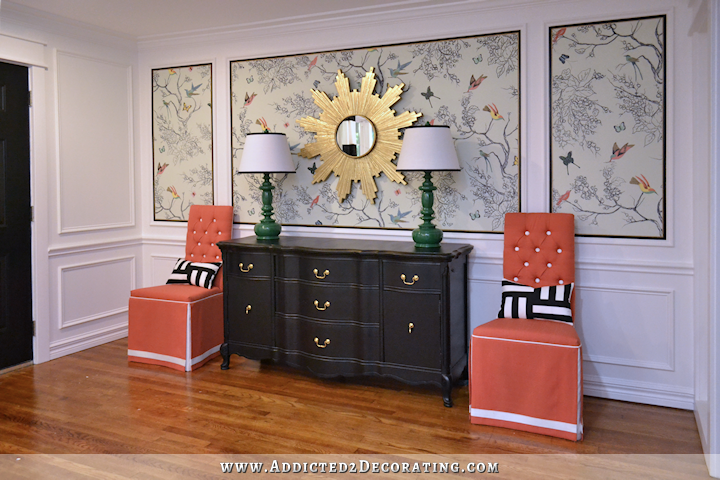 I do love the contrast of the chairs and the black buffet with the bright white walls. 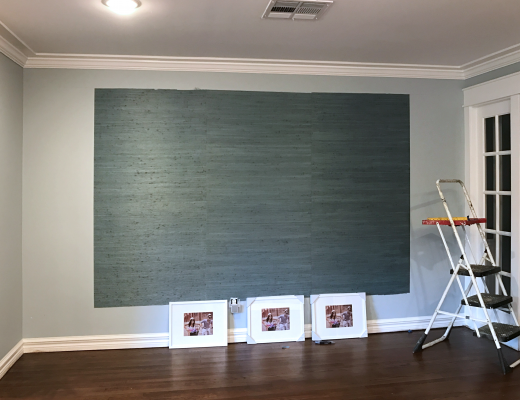 And when I changed the wall color, the mural looked really washed out, so I added a thin black border around those panels. It’s actually what I had planned to do from the beginning. I like the boldness of a black border. The thin gold border is still there, but it just doesn’t show up in these small pictures. It’s noticeable in person, though. So that’s it for now. It’s not quite a finished room, but at least it’s a finished area. And it’s not really even completely finished, because I still need to do some accessorizing. I’ll be honest…accessorizing a room with little trinkets and tchotchkes is my least favorite part of the whole decorating process. I know it adds quite a bit to the finished look of a room, but right now I’m just enjoying having the big projects done in this area. Did you go with a different pattern for the pillows on the chairs? I did, and I still don’t like them. I didn’t like how big the first ones were, so I went with more of a smaller lumbar pillow. But now they’re so short that the pattern really doesn’t show up. 🙁 I really wanted something bold/graphic/geometric in black and white on those pillows, so I’m not really sure what I’ll end up with. I’ll keep those for now while I focus on the dining room, and maybe a great idea will pop into my head while working on other projects. I think the pattern shows up on the pillows. The black and white is very bold. I think the new size is better suited to the chairs. I like these pillows too! I like the whole group, and I’m not usually a “white wall” person! But it looks perfection here! I agree. These are the best yet (if you have to have them at all). The lumbar pillows look GREAT! The pattern does show up just fine, so don’t worry about that. The new shape and size of them are really good, not hiding all the tufting work that you worked so hard on. It’s absolutely stunning and I love the pillows. Is there some avenue where you could submit this room into a contest of some sort, because you will win hands down. 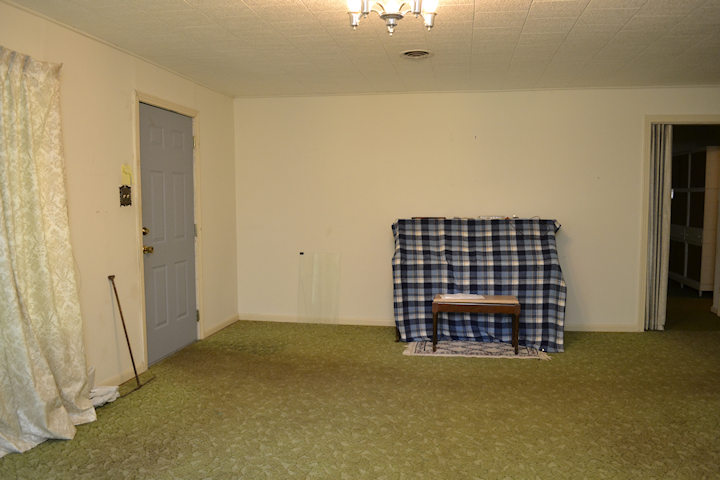 Oh, and that music room is so amazing – those doors – I loved those the minute you started working on them. Wow, now that made me smile. Looks great! Looks like a million bucks! The white walls were definitely the right choice. The green was pretty but there was too much going on. Love it! Are you going to put an area rug down? No. Rugs and wheelchairs don’t mix very well. I didn’t think so but I remembered seeing your rug choices in other rooms. I should have known that it would not be practical by the front door! Maybe someday a beautiful painted floor mimicking a runner and helping to define the entryway? Just a thought :). My mil can’t put down rugs either so she used a darker stain and created a beautiful design in front of the door to define the space. That area has a wow factor x’s 10!!! I love that you went back to the white on the walls. It really makes the mural pop, which is a wow factor all by itself! Love…love, everything! That is absolutely beautiful and you should be very proud of yourself for all your hard work. I do love this area. Very nice work. Absolutely gorgeous! I can’t believe the difference! I didn’t comment on your post yesterday, but think you are headed in the right direction with talking to contractors to do some major projects for you. Good luck! Looks great! It all goes together nicely. Looks beautiful! What a transformation! I started following you mid-way into this transformation so I hadn’t seen the before pictures. Now that I have I’m blown away! This is such an amazing transformation! Your lovely mural looks like custom artwork, the chairs and the buffet, the two lights, the colors – I love all of it. 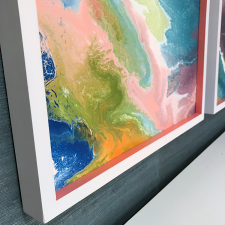 It’s so inspiring to see the details of the change one project at a time. How is a mural not custom artwork, she’s definitely an artist. I completely agree with you and didn’t mean to imply otherwise. I’m in total awe of that wall and every single item in that space. Love it, so chic. Add me to the “love the white walls” category. That came out awesome!!! Congrats! I know this sounds strange, but even though you added stuff (trim, furniture, etc. ), the space somehow looks bigger. Funny how perspective works like that. I agree! Beautiful work! Looks much bigger than it really is and so well done! I was actually thinking the same thing! Great job Kristi! I thought the same thing! It does look bigger. Gorgeous. I think it’s really pretty, and so different from the temporary living room decor. Love it! Love the change to white. And you used the pillow pattern idea that I posted about yesterday (though you had probably already made yours when I posted). Too funny. Kristi, this looks like a model home! How wonderful to have your talents to transform what was dull mega dull into something that should be seen in HGTV or Architectural Digest. I am “blown away” and you are such an encouragement to all of us who just lack vision and the how-to’s. Wow, wow, wow! I am in complete awe of your terrific work. The chairs, the buffet, the lamps, the floor, and ESPECIALLY the mural. Love the butterflies and birds. You are extremely talented and I enjoy seeing all your beautiful work and understanding the thinking behind your design choices. Can’t wait to see what’s up next! 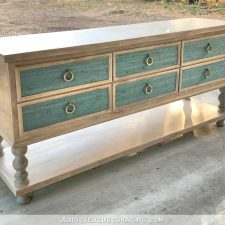 You definitely have one of the best blogs around, Kristi! Beautiful!! 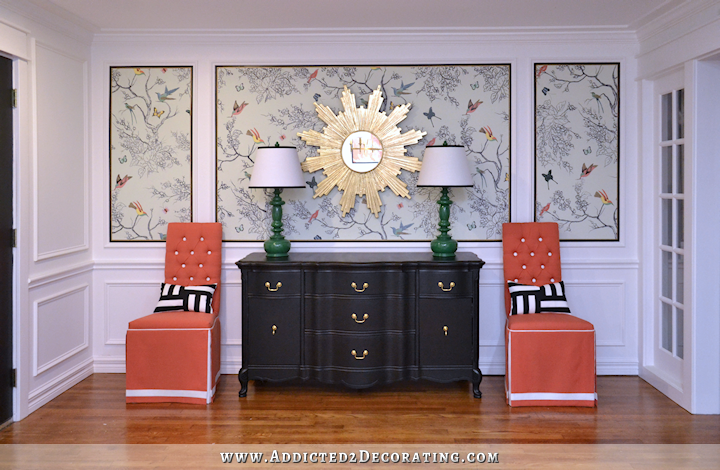 I love the white walls and I noticed the black frame around your murals right away, it really does make them stand out. I love what you have done. 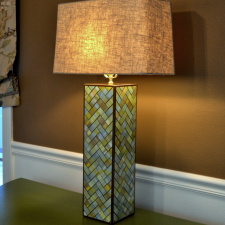 Just my opinion, I don’t care for the green lamps but, I know you love color. The green is so bold against the orange chairs. Maybe when you get the accessories done it will pull everything together. I agree. I’m thinking a non-painted lamp would be better. 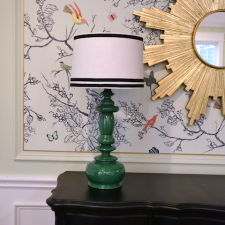 I just don’t think a painted lamp looks rich enough for what else is going on. That said, it is a beautiful entry. I also have a question with the green lamps. But knowing you, I hesitate to say anything because you change things. It’s just an artist’s perspective I guess. The total view of the one wall is awesome. Nice to see you’ve got your groove back! Kristi, it is so lovely and uplifting! I hope you smile every time you look at it! I like the smaller size, too. The entryway is beautiful! Absolutely beautiful! It is a defined entryway but in the case of a large dinner party it could easily be used as the buffet area of the dining room. Makes it very versatile! You are my hero in DYI you have no fear and I love that. I love it! It’s absolutely gorgeous! That is an AMAZING transformation! 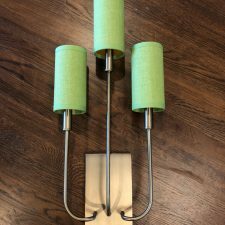 Do the green lamps still tie in with other parts of the dining room? Will be interested in seeing the full view. Absolutely awesome, as usual! All of your hard work is really paying off. Your home is gorgeous and everything is well-built and unique! Love your blog! You sure do have fortitude Kristi…I don’t know that I could make all the multiple changes with paint, etcetera to get to the point where I was happy. 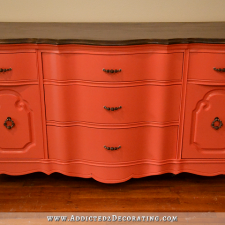 I would probably lived with it unhappily until it needed a repaint…and life’s too short for that. 🙂 Awesome job…be proud it’s beautiful. What a beautiful space! 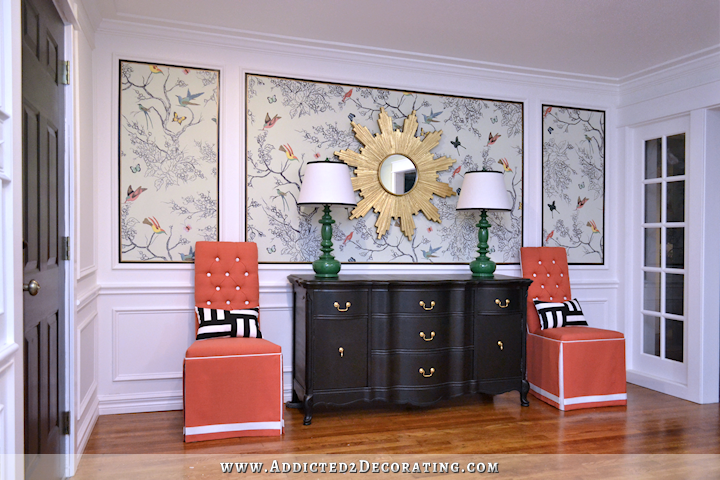 Your walls are amazing, too! 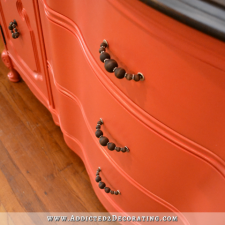 Love to see the use of bold colors even though I’m not brave enough (yet) to use them in my own home. You’re an inspiration and should be so proud of your lovely home! Truly a great transformation! Love the white walls and contrast. So glad to know someone else is not fond of accessorizing! My least favorite thing to do! I’m with Deb on the wall paint. If I were unhappy with my paint color, I’d leave it because it would be too much trouble painting it again…and I’d stay unhappy. Good for you for changing it so you’ll be happy. I think there’s a life lesson in there…. BTW, on the pillows. I like the lumbar size, and I like geometric designs as you do. 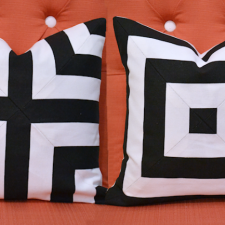 What about doing two lumbar pillows with diagonal striping and placing each pattern going in the opposite direction? Hope this makes sense…. Wow, what a transformation……if you didn’t know it was the same space, you’d think it was a different house. 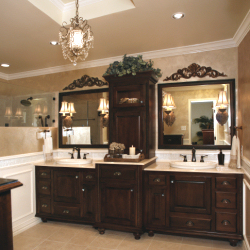 From dull and drab to stunningly gorgeous, fresh and modern. It looks incredible and the space looks so much bigger. You must be so proud of your vision and accomplishment. 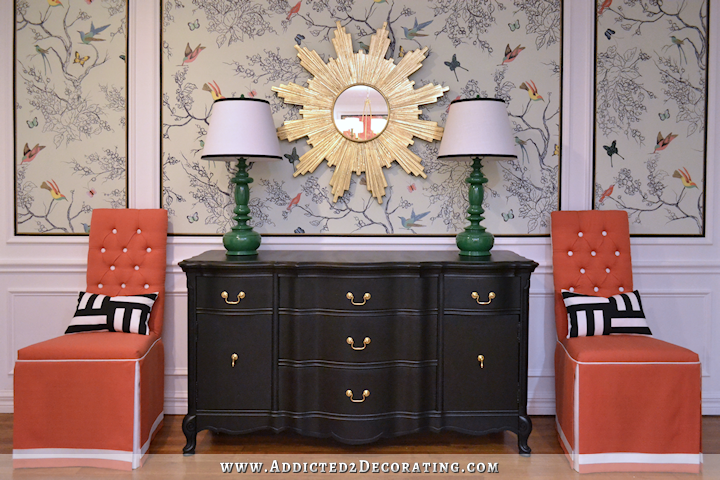 Love the walls white now that the furniture is there and loving the black border on the mural, it really makes it pop and gives it the wow factor. 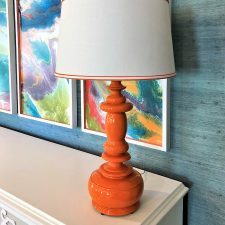 Whilst I love everything, now that I see the full reveal, IMHO, I think while the green base on lamps look gorgeous against your mural and on the buffet, the color to me seems to be competing too much with the coral chairs. But as you’ve said, you haven’t finished accessorizing yet, so it may all come together. Kristi, you have been an inspiration. Since I’ve been following you (about 2 years) I’ve painted my bathtub, tiled my bathroom with a chair rail around the bathroom. Installed built-in cabinets in my dinning room with a wood countertop (like what you did in the condo) Purchased a power drill, palm sander, compressor, air-paint gun, kraig jig. My husband has commented that I will soon surpass him in power tools (not really, he’s an auto mechanic). 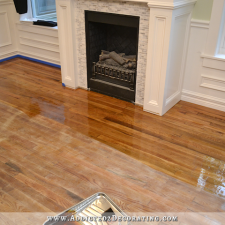 I will be installing crown molding, hardwood flooring in the family room – dinning room area. I turn 50 next week and Love, Love, Love your inspirational, step by step instructions that have sparked a new me. 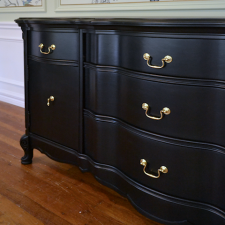 Your entryway looks beautiful! Love all the color. Isn’t it funny what you notice: The first thing I caught was the black outline on your mural (which really made it pop) yet I didn’t notice the green walls were gone until I read the post . Love the lumbar sized pillows. 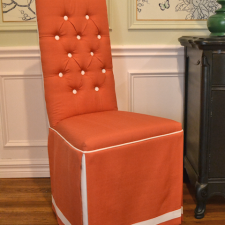 If they’re still not clicking for you, how do you feel about a plain stripe (no miters)? I know, I know… You’ll figure it out! Beautiful! That mural really makes the room! I also like the white walls – they provide a crisp background for the glorious color. Oh gosh. Just wonderful, Krisi! As for ‘accessorizing’ the space, it looks really nice with just the clean lines. You are a brave person to tackle that home, but you’ve made the areas so inviting! You have taken a nothing area and surpassed my expectations. Absolutely amazing… You are the bomb! Love watching you …thank you for sharing! I like the green lamps! They don’t jump in your face and demand attention! 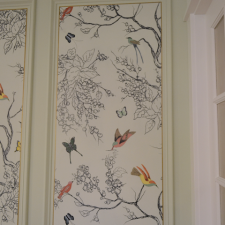 The green picks up some of the same green from the birds and butterflies in the mural; as the coral chairs do. It all compliments one another! 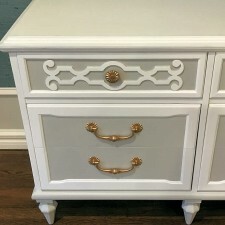 Kristi, you have again completed another great project! And if you choose to change it again, so be it……it is your home and we were invited in for a view and not live with it day in and day out as you and Matt do! Blessings on your grieving process because that is what it is…..a process! What you feel today will change, but it will take time! : ) Hugs! I know pride is one of the 7 deadly sins, but if I accomplished in my house what you have done here (not to mention all of the other rooms) I’d be dragging people off the street to brag. You are one talented decorator! Amazing!!! It must feel wonderful to look at those pictures and see what an amazing transformation you have accomplished! I relate to your process and the changes you make. Sometimes you just need to do it to see that it’s really something else that you want and sometimes the process just lends itself to something different than originally planned. I love that you do things until you get it just the way you want and that you don’t cave in to what others think you should do. My late husband used to tell people that he never knew what color the walls were going to be when he got home from work. I was blessed that he loved that about me and didn’t complain about it. He was so easy going as your beloved Matt seems to be. Continued prayers for your mom, you and the rest of your family as you grieve the loss of your “Bonus Dad”. Losing our loved ones is so deeply painful, and the more we love someone, the harder it is when they are no longer with us (physically). Be kind to yourself and do what you need to do to work through and deal with your grief. Kristi, you are truly amazing! 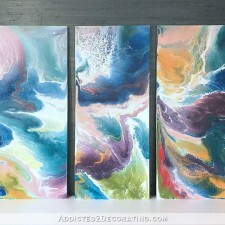 I love how you try things and change them til you get it just right (I am sort of that way, too–it makes me feel better knowing that even much more talented people than I also have to go through trial and error! Ha, ha!) 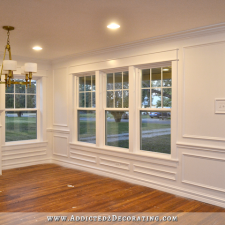 It is so amazing how architectural trim and designer details can transform a boring ‘ol typical builder home into something that looks like a very high-end custom home! It would be interesting to know how much you’ve added in resale value just by the trim work and detailing–any ideas on that? Just curious. You say that you didn’t have an entry–well I think you have successfully created the illusion of one now, for all intents and purposes!!! Stunning. Absolutely, take-my-breath-away stunning. You’re right: It doesn’t look like it could possibly be the same house. I love it all. Your entry /dining areas are beautiful. 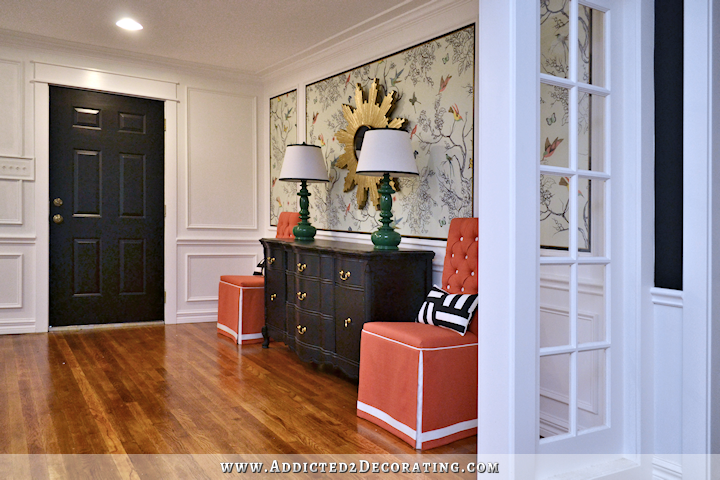 The black trim really enhances your murals, and the white walls take the area to a level of elegance. The lamps and buffet really are cohesive with your choices. I sooo admire your creativity and skill sets. Everyday I can’t wait to read your post. I think the room is gorgeous! You are a genius! Even though I personally am not a white walls kind of person either, I do prefer them to the light green that you have just painted over. And the black mural outline looks great, as well. The photos DO show the gold outline, too. This space is so full of life now; I just love what you’ve done! I agree. I much prefer the white to the previous green shade. aBSOLUTELY STUNNING You did a fabulous job!!!! Such a beautiful transformation. It is amazing to see the before and after. Especially seeing that horrible carpet with the nasty traffic marks that you started with. Yuk! It’s so pretty now. Well done. Looks great! Congratulations on the finished entryway! WOW KRISTI, just WOW….!!!! Simply AMAZING….!!! Look at you go! Beautiful. Love the changes you made. Looks great. I agree with going back to the all white walls once the chairs entered into the mix. 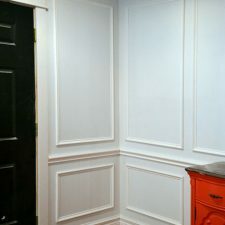 The all white is a better backdrop for all the other colors going on in the room and I think the molding looks better in white. I think the first rectangular pattern would look good on the pillows even though you didn’t want to repeat with more rectangles, I think it would add symmetry and tie them back to the rest of the room. Just my opinion. The previous owner would never recognize their house now. What a difference. Can’t wait to see the rest as it evolves. Glad you ended up with the white walls! You did a wonderful job! Personally, I love the symmetry! Hope you are enjoying the fruits of your labor! I love it! 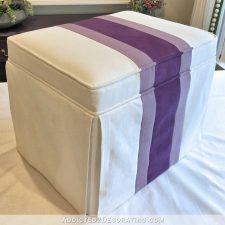 and I’m loving the fact that you thought of a 3rd way to use the fabric for the decorative pillows!! Everything is beautiful!! Don’t hesitate to let me know if I can help you monetize your decorating skills!! Let’s get your addition built, asap!!!! Kristi – I am in total awe of your talents. It is perfection. You have such wonderful taste. 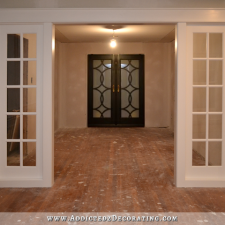 You did an amazing transformation, and made a really beautiful entryway. Again, congratulations! Kristi, I so love everything you’ve done. I wonder if you would be willing to give us ideas and advice on things. I am 67 years old and recently bought my first house, an old double-wide mobile home, and I have to replace the floors. I don’t have much money though. 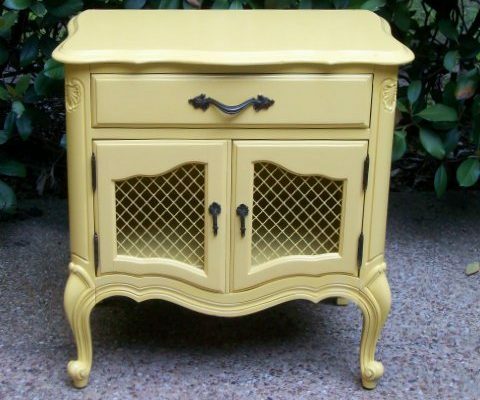 I was thinking about getting some thin plywood and putting it everywhere, then painting/stenciling. If you don’t wish to share ideas/advice, I will understand. If you were to start a second blog, as if you have time for it!, I am sure you would get lots of questions from everyone out here! Thanks. 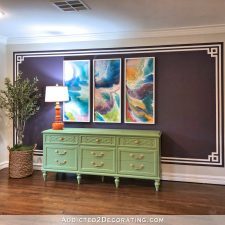 I just found your blog am considering doing the same picture frame moulding, base boards, and crown moulding but am having a hard time deciphering what you used to make them. 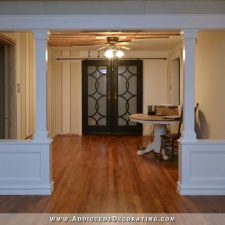 Were the picture frame moldings from a piece of trim at Home Depot? I also can’t find that beautiful baseboard and crown mouldings you used. I have a hard time piecing things together but absolutely LOVE what you did here . 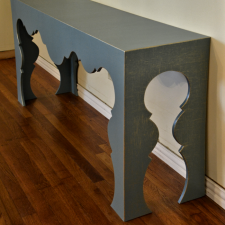 Can you spill your secrets about the trim pieces used and where you got them? I’m sure you’ve heard this hundreds of times, and I hope you’re not tired of hearing it 🙂 – you are a truly talented designer and your work is inspirational. That half wall with glass panels in the entryway is a stoke of genius! Amazing transformation… you’re such an inspiration!